Just About Anything: Finally A Mom! You must have already read about my pregnancy, labor and my delivery in my previous CC post so I wouldn't dwell on that here. Looks like I haven't been following instructions. Lol! As expected, because my baby is tiny (at 2275grams birthweight), she had to be incubated and closely monitored. Nothing is wrong with her though, except for the fact that she has low birthweight. She was already out of the incubator after a day and have been gulping her milk like a very hungry horse. 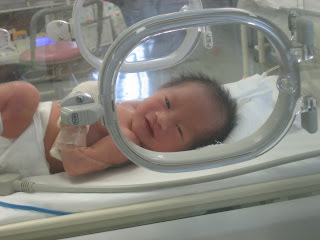 She was progressing very well and was back into our ward after 4 days and I was able to nurse and breastfeed her then. I was supposed to be discharged from the hospital first but when my routine blood tests came out, my OB had to check me again because my WBC levels are way too high. I was on hooked on antibiotics for a few days and had to stop breastfeeding my baby again. You could just imagine how painful a nursing mom's breasts could get not being able to nurse. I had to regularly pump the milk out just to relieve the pain. And so it was that both my baby and I were discharged on the same day. I think it was March 11 when we were both discharged. It was also the day when my sister arrived in Tokyo to help me out during the first three months. Samantha's godmother Ate Zera accompanied us back home to Yokohama and Hubby fetched my sister at Narita airport. I was surprised to find a "welcome home" banner posted on our wall. I know it was lovingly made by Hubby and I was really touched. I know it must be very hard on him to juggle his way between the hospital and work considering that we were confined in Fuchu, Tokyo and he was working in Yokohama. And after almost three weeks of Hubby being home alone, we were finally home at last. Ah, home sweet home! I love this post :Dhehe..
Hehehe, oks lang kahit di ka sumunod sa instruction.. bakit pala nag low count ang WB mo? sa delivery kaya? Well, I am glad that you and Sam are fine now. 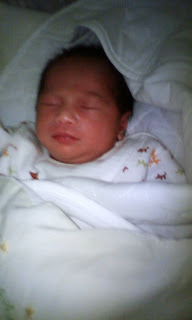 Sa mga anak ko si Dan ang low birth weight, tapos yung 3 magkakasunod, mga dagul na ng ipanganak. Hehehe! Your hubby is so sweet naman, iba talaga kapag me support ng mga hubbies, nakakawala ng pain and misery. you baby looked healthy even she was underweight. awww...it was sweet of your hubby taking time to make that welcome banner. maybe it was his way too of saying thank you for giving him a beautiful baby girl. btw, sorry if I missed 2 Tuesdays of TCP. got busy with my daughter's enrollment and everything. will join again next week. God bless you and your family always!